Eduardo, 31, with his daughter Sara at his house in Chiapas, Mexico. Eduardo together with his wife and four daughters, escaped increasing gang violence from El Salvador and have been recognized as refugees in Mexico. The United States government decision to end its border policy of forcibly separating migrant children from their parents, does not help thousands of youngsters already in detention, who should be released and reunited with their families, a group of UN rights experts said on Friday. The group of 11 independent Special Rapporteurs, and other experts, insist that the detention of the migrant children – “most” of whom are asylum-seekers from Guatemala, El Salvador and Honduras - inside the US, “severely hampers their development and in some cases, may amount to torture”. Their statement issued to reporters in Geneva, follows President Donald Trump’s decision to sign an Executive Order ending the practice of forcible separation on Wednesday, two months after the so-called “zero-tolerance” policy was introduced. The order calls for detaining family members together, who are caught attempting to enter the US, mostly at the southern border with Mexico. “We call on the Government of the US to release these children from immigrant detention and to reunite them with their families based on the best interests of the child, and the rights of the child to liberty and family unity,” the statement added. Echoing that point of view, the UN Children’s Fund (UNICEF) said on Friday that it was opposed to separating children from their families for the purposes of migration control. An alternative would be to take a non-custodial community approach, Mr. Boulierac added. Last Monday, the UN Secretary-General, António Guterres, said in a statement that “as a matter of principle” refugees and migrants should always be “treated with respect and dignity, and in accordance with existing international law,” although he did not single out the US in this regard. 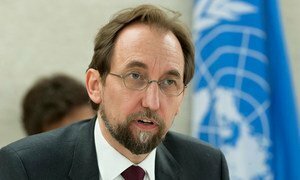 UN Human Rights chief, Zeid Ra’ad Al Hussein told the opening of the Human Rights Council in Geneva on Monday, that the practice of child migrant separation, amounted to “government-sanctioned child abuse” which may cause “irreparable harm” with “lifelong consequences”. Special Rapporteurs address either specific country situations or thematic issues, across all parts of the world, and work on a voluntary basis, without any salary or remuneration for their work.